Maria Menjivar came to NMIC in October of 2016 for an eligibility screening to apply for U.S. Citizenship. Mrs. Menjivar is a disabled individual who lives in Harlem and also suffers from memory impairment. Mrs. Menjivar is married and has 8 children, 3 of which were born in the United States. Mrs. Menjivar was moved to a shelter when her building was shut down for safety violations. Mrs. Menjivar was relocated to a shelter in an unsafe neighborhood in Kings County. NMIC accommodated Mrs. Menjivar with the process of completing her Naturalization application in the early hours of the morning, in order to avoid her traveling back to the shelter in Brooklyn after dark. 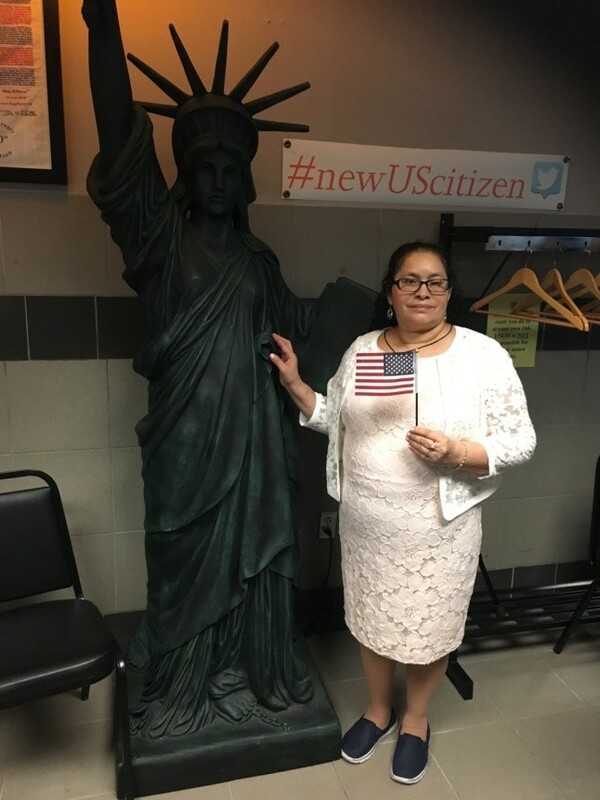 NMIC diligently completed and submitted Mrs. Menjivar’s application with USCIS in February of 2017. Mrs. Menjivar’s first interview was in July and did not go very well. The USCIS officer did not accept Mrs. Menjivar’s medical exemption for the Civics exam. As a result, Mrs. Menjivar failed the exam without recourse. Mrs. Menjivar was given a second chance in September to pass the Civics test. NMIC assisted Mrs. Menjivar with obtaining competent evidence in support of her medical exemption. As a result, Mrs. Menjivar was finally approved for Naturalization and took the Oath to become a U.S. Citizen on November 3rd, 2017.